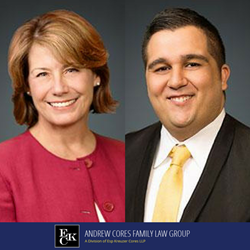 Andrew Cores Family Law Group, a division of Esp Kreuzer Cores LLP, is excited to announce the addition of attorneys Annette K. Corrigan and James F. Zanayed to the firm. Andrew Cores Family Law Group, a division of Esp Kreuzer Cores LLP, is excited to announce the addition of attorneys Annette K. Corrigan and James F. Zanayed to the firm. Both are working as associate attorneys out of the firm’s Wheaton office and focus on family law. Attorney Annette Corrigan received her juris doctor from Marquette University. After practicing in the Kansas City area, she began practicing law in Illinois in 1991 at a law firm in Naperville, where Corrigan was part of establishing the firm’s first litigation team. In 2000, Corrigan left the practice to focus on raising her children and was active in the Wheaton community. In 2015, she resumed the full-time practice of law with a focus on family law. In 2017, Corrigan was recognized as one of the 10 Best Attorneys in Illinois by the American Institute of Family Law Attorneys. At Andrew Cores Family Law Group, she will use her skills as a litigator to help clients with difficult family law matters including divorce, paternity, child support, allocation of parental responsibilities, allocation of parenting time, relocation, asset valuation, post-decree issues and litigation. Corrigan is a member of the DuPage County Bar Association, serving on the editorial board of the DCBA Brief publication. Attorney James Zanayed is a 2017 graduate of the Northern Illinois University School of Law, where he also received a bachelor’s degree in political science in 2013. While at the university, he was heavily involved in student government and groups focused on legal studies. Zanayed was the speaker of the NIU Student Senate, leading a group of students overseeing a multi-million-dollar budget. He also represented the student body as a trustee on the NIU Board of Trustees. He served as an associate justice and the chief justice of the NIU Student Association Supreme Court. As a member of the NIU Law Review Executive Board, he supervised the editing and publication of legal articles. Zanayed represents clients in all areas of family law including divorce, paternity, child support, allocation of parental responsibilities, allocation of parenting time, relocation, asset valuation, post-decree issues and litigation. Zanayed is a member of the Illinois State Bar Association, Chicago Bar Association, and DuPage County Bar Association. Andrew Cores Family Law Group is a division of Esp Kreuzer Cores LLP. The Wheaton family law firm has effectively served clients in Northern Illinois since 1996, with offices located in Wheaton, Oswego, and Downtown Chicago. The experienced attorneys at Andrew Cores Family Law Group provide compassionate and skilled representation with matters pertaining to divorce, high-asset divorce, child support, child custody, collaborative law, and mediation. The Illinois family law firm is dedicated to obtaining the best possible outcomes for clients and their families. For more information or to schedule a consultation to discuss your legal matter, call 630-871-1002 or visit https://www.coresdivorcelawyers.com/.